Popular Italian restaurant Nonna and I has established itself as a family favourite in its quaint and cosy Norwood location. Now they have some very exciting news to share; they have opened a new, bigger sister restaurant so now you can bring along even more family and friends for a meal. The new digs are all very familiar, a repeat of the Tuscan mural on the walls and ceiling, the same broad and exciting menu that caters to every taste and dietary requirement (vegetarians and vegans are well catered for) and of course the ever jovial and excitable Chef Khalil and his infectious smile. Adelaide Food Central was invited to celebrate the opening of the new restaurant located on Magill Road, Kensington Gardens. As so many traditional Italian meals do, we started off with an Antipasto Plate. 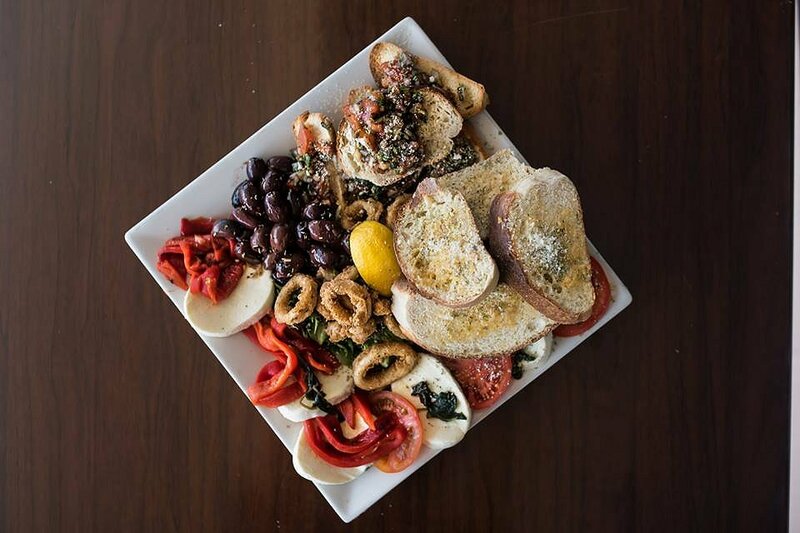 Piled high with fresh mozzarella and tomato slices, strips of roasted capsicum, melt in the mouth olives, fried calamari, tomato bruschetta and Chef Kahlil’s home made bread which was topped with garlic. Lashings of olive oil and balsamic vinegar graced the plate and we found ourselves asking for extra bread so as to not waste any of the tasty dressings. No antipasto plate would be complete without a glass of wine and today’s pairing was one of my new favourite varietals 2016 Eden Hall Gruner Veltliner. I’ve seen quite a few Gruners coming through tastings recently; this one from Eden Valley Wines has notes of stone fruit, lychee and grapefruit. 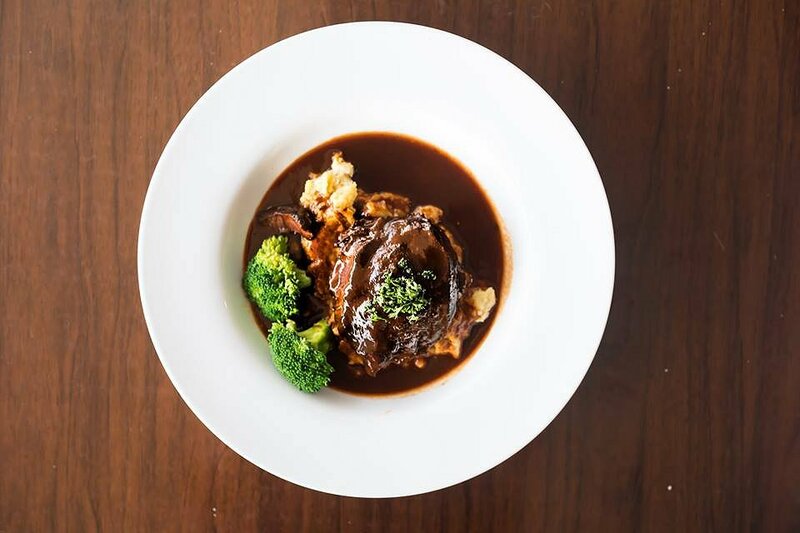 For a second course we delighted in tender Beef Cheeks that swam in a balsamic and red wine reduction. The luscious meat was impeccably tender and rich and when paired with Nonna and I’s signature garlic mash it was heavenly. A couple of stalks of broccoli, served just under al dente added a much needed fresh component. We thoroughly enjoyed the 2015 Stage Door Wine Co.’s Full House Cabernet Sauvignon which was full bodied enough to balance against the bold flavours of dish. 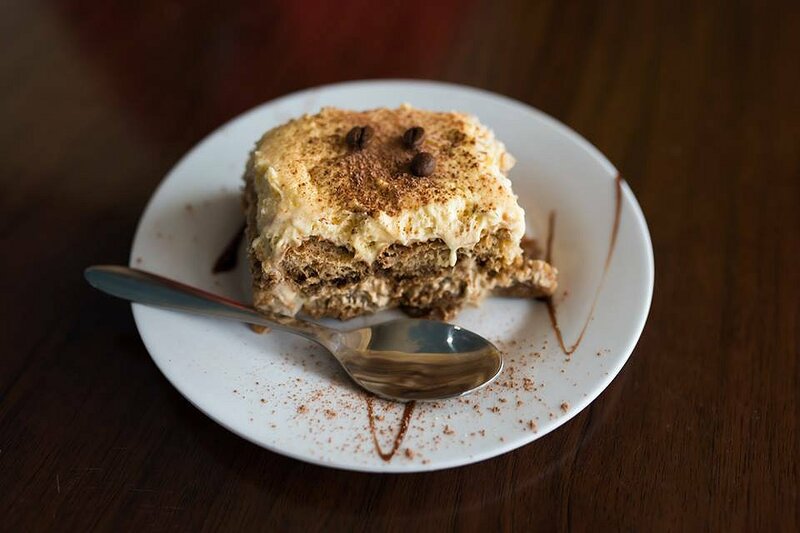 To please our sweet tooth we were presented with a helping of Tiramisu. The layered dessert of sponge fingers and cream was moist, bordering on wet with coffee and liquor. A unique texture but the table agreed it was very enjoyable. Who doesn’t love a glass of sticky with a rich dessert? We indulged in a glass of 2006 Eden Hall Ratafia Riesling which ended the afternoon perfectly. It’s wonderful to see the growing success and expansion of Nonna and I. The new restaurant features a private dining space for up to 20 people that is perfect for celebrations and small functions, Chef Khalil proudly refers to the area as Little Italy. There is also a cooking school attached to the Magill Road restaurant called 324 which will conduct classes for 5-12 people. Chef Khalil’s motto is “come hungry, leave happy” and now we have even more ways to do just that.